I have been using a lot of Peter Drucker quotes since I entered marketing over 18 years ago. And I have been using them a lot lately in this blog here and here, and in many of the presentations I’ve been giving. The aim of marketing is to know and understand the customer so well the product or service fits him and sells itself… The aim of marketing is to make selling superfluous. So I did some research and found this great paper by Frederick E. Webster Jr., published in the Academy of Marketing Science in 2008. I found the paper really fascinating and would like to summarize it here for all of you to read and consider as you add those finishing touches to your 2012 marketing plans. And I hope you will come to the same conclusion I did: It’s a good time to be in Marketing! That’s the title Frederick gave his paper. But isn’t marketing and management and Drucker’s writings all about business? So I decided to use the more modern term in the blog title. I think many marketers will agree that Drucker’s quote above is one of the best descriptions of the aim or goal of marketing. And yet, I was surprised to learn that Drucker himself didn’t consider himself an expert in marketing. It’s also important to understand that Drucker considered marketing to be the responsibility of the managing leadership within a business, not a separate function. And it is this view that often gets lost in many B2B Marketing organizations where marketing is subservient to sales. When in fact, we should work hand-in-hand to support our buyers through their journey. Marketing is so basic that it is not just enough to have a strong sales department and to entrust marketing to it. Marketing is not only much broader than selling; it is not a specialized activity at all. It encompasses the entire business. It is the whole business seen from the point of view of its final result, that is from the customer’s point of view. Concern and responsibility for marketing must therefore permeate all areas of the enterprise. Or to put it another way, marketing is really important and the job of marketing (focusing on customers) is the most important aspect of a successful business. If you don’t believe me, the paper even asserts that research has backed up the fact that customer and market-oriented businesses achieve better business results in the form of revenue and profit. The importance of balancing a focus on short-term financial results and long-term viability. The importance of an organization’s ability to adapt to changing market conditions. The need for continuous innovation based on a deep understanding of customer needs. The requirement that businesses seek to create satisfied employees as a moral, social and financial obligation. A warning against the excessive use of sales promotional tactics. Webster concludes his paper by saying that a careful review of Peter Drucker’s views on marketing, management and business paint an optimistic future for marketing. Of course that’s music to my ears. I also believe that marketing is central to the business as the advocate for customers and as the core communicators of a value-based message. And I think the markets shift to digital communication formats, mobile accessibility, everything on “the cloud,” social engagement and the renewed focus on content strategy are making this a good time to be a marketer. Do you agree it’s a good time to be a marketer? 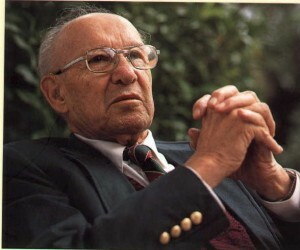 Have you been inspired by Peter Drucker and his famous quotes? Have you used them in your own business? In many organizations, this is beyond the scope of the marketing function, residing in product development and service groups. In these organizations, ‘marketing’ activity isn’t business, it is communication, and marketing either does not own the customer experience or they are responsible for it but do not have sufficient influence over it. What is particularly interesting to me is how this comes full circle with the social business, which firmly puts the customer at the center again. As a Marketing student who is just entering the industry, it is very easy to get overwhelmed with the new direction marketing is taking (social media etc). It’s important to remember that it is a good time to be a marketer. I think Peter Drucker is a very smart man and the quotes you have mentioned bring a smile to my face. “The aim of marketing is to know and understand the customer so well the product or service fits him and sells itself…” It’s exactly right. And I agree with you as well Marketing IS Business! Zoe, thanks so much. You can never go wrong telling me that an article is inspiring!!! Your comment is exactly why I am so excited for young marketers like you to enter the workforce and start schooling some of the traditional folks on how to BE social and apply it to help our businesses engage with customers. And isn’t it amazing that Drucker wrote most of this stuff in 1954 and the lessons still apply today. It’s a real shame that he isn’t taught and understood by even more marketers and marketing professors. hence why I wrote this. Thanks so much for your comment and keep up the great work! Great post! Have you heard of the concept of Conscious Capitalism? There are a fair amount of articles and interviews I’ve come across recently with regard to Conscious Capitalism that echo some of your statements here, such as the need for businesses to have a long-term focus, for equal attention to be given to stakeholders (i.e. employees, investors, society) as opposed to just shareholders, having organizational cultures and leaders that foster trust and innovation instead of cultures of fear. Companies that are adopting this type of forward-thinking approach to their business, such as Zappos, Whole Foods, Trader Joe’s, and Southwest Airlines, are finding themselves to be just as profitable as ever while at the same showing up on the “Best Places to Work” lists. Thanks Tiffany. I will definitely check out the links. I totally get the concept and look forward to reading what you have written about it. Michael, really appreciate you posting this and for your synopsis as it is quite timely for me. I’m writing an article for Huffington Post Small Business titled: The Marketing Director is the Hope of Small Business. While I agree with Drucker that Marketing IS Management, in an SMB firm, the ultimate playmaker is the Marketing Director (or any person, consultant, adviser filling that role). They are tasked with the responsibility for getting it done and often operate without a net. How exciting. I have been that Marketing Director at a small firm and was tasked with getting it done. And with very little budget or staff. I look forward to seeing your views. I am interested to hear how you see Drucker’s marketing perspective apply to the non-profit sector, where an organization provides a public good and is supported by individual donors and foundations. Thank you in advance for your response and for sharing any relevant resources you have on this topic. Hi Maria, I think his ideas are even more important for non-profits. Peter’s assertion is that the business’ only purpose is to serve. And marketing’s job is to creative innovative ways to both do that (the service itself) and communicate that service (the classic definition of marketing). I’m not aware of any resources to direct you to but that’s at least my interpretation.